It was another beautiful weekend in Chicagoland with perfect running temps to kick off the holiday weekend. 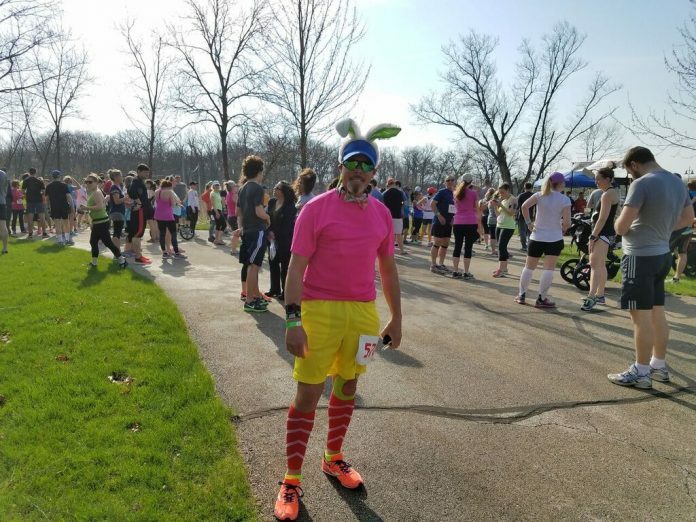 Saturday, a few hundred runners gathered in Independence Grove Forest Preserve in Libertyville for the the Bunny Wabbit 5K/10K/15K and kids dash. The family friendly event started with the kids egg hunt and 200 meter dash at 8 a.m. A costumed runner led the kids dash and it was fun to watch the little ones chase the Bunny Wabbit. Once the kids activities concluded, runners gathered for their 9 a.m. start. Many wore festive attire and had family to support them. 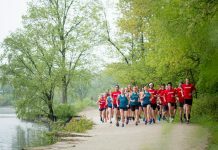 Runners had the choice between three distances: 5K, 10K and 15K. The course was a 5K loop with ~4K of the loop on the paved trail and the remainder on a gravel path. Depending on your distance, you completed one to three loops passing through the finish every time. 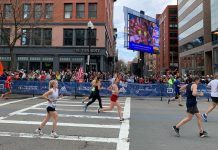 Even though there was no congestion on the path, the race directors did a great job of reminding runners about path etiquette and asked to stay at two runners wide at a maximum. There was some wind on sections of the 5K loop that kept it honest for racers. Runners crossed the finish line and were awarded a nice medal and ample refresh options. Other swag items included a cotton tee and Powerbar. Even though I was one of the last 15K racers, there was still a decent number of supporters and runners hanging around the finish line. 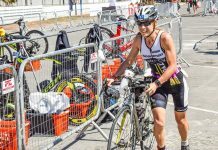 While I still love big races, some of my favorite races are the local based events with community support and easy race day logistics. Bunny Wabbit exemplifies that for me. Parking is 50 feet from the start, full bathrooms pre-race and a laid back feel. The Race Director is an ultra-marathoner that understands racers. He also can’t shake his ultra roots with placing oranges and bananas at the aid stations!